Is Ryan Newman Lesbian ? American actress, Ryan Newman is best known for portraying the role of Ginger Falcone in the Disney sitcom, Zeke, and Luther. In 2010, she earned Young Artist Award for Best Performance in a TV Series by a Leading Actress for Hannah Montana and iCarly. Ryan Newman started her career at the age of 3 through print modeling and commercials. Newman has always maintained a low-key personal life. Currently resides in California, she is quite ambitious and hardworking. Ryan Newman was born Ryan Whitney Newman on April 24, 1998, in Manhattan Beach, California, the US under the birth sign of Taurus. She is the youngest daughter of Jody and Rick Newman. She is American and belongs to the White-American ethnicity. Newman describes herself as "half Jewish and half Christian. She has an elder sister, Jessica Newman. Newman attended the Pennekamp Elementary school up until fourth grade. Then she went to Rancho Pico Junior High School in Stevenson Ranch, California. Ryan Newman started her career as a child artist, she featured in the Kraft Cheese commercial which was aired internationally for more than two years on the TV screen. Newman debuted in films at the age of seven with 2006 movie, Monster House as Eliza. The same year, she appeared in Zoom where she portrayed the role of young superhero, which required her to train in martial arts. Newman made her TV debut with Disney's hit show Hannah Montana as a young Miley. She has worked on other Disney shows as well including Good Luck Charlie and Zeke and Luther. She won the Young Artist Award in the category of Best Performance in a TV Series by a Leading Actress for Hannah Montana and iCarly. In 2012, Ryan Newman starred in the lead role on Nick's TV series, See Dad Run as Emily Hobbs. She was in the show till its finale episode which was aired on 2015 end. She replaced the Aubrey Peeples in Sharknado 3: Oh Hell No! Some of her screen credit includes Lower Learning, The Call, AthenaGirls, Paradise Run, Bad Sister, and Sharknado: The 4th Awakens. Ryan Newman has an estimated net worth of $950 thousand as per some online sources, but no official confirmation has come about it. She is active in the showbiz since 2001 and her salary ranges between $150k-$300k per year. She earned above $30k per episode for her appearance in Tv series. Her debut movie, Monster House was a blockbuster which grossed more than $140.2 million at the box office while the budget was $75 million. IMDb rated the movie with 6.6 stars. She shared the screen with actors like Mitchel Musso, Sam Lerner, Spencer Locke. Ryan Newman is possibly single at the present but previously she dated actor Jack Griffo. The duo first met on the set of The Thundermans, they played the role of one another love interest in the series. After a few datings, they eventually fell in love. However, the couple failed to handle their love life and officially called off their 3 years long relationship in 2017. Ryan Newman then reportedly dated actor Devon Bagby. The duo is yet to confirm their relationship but many leading websites are claiming they are together. Newman shared a good bonding with her co-star, Taylor Dooley. She is quite popular on social sites, especially on Instagram as of 2018 she has more than 1m followers. She is also active in philanthropic activists, in 2014, Newman traveled to Cambodia to supports the Heifer International, a global nonprofit association to remove poverty and hunger through sustainable, values-based holistic community development. 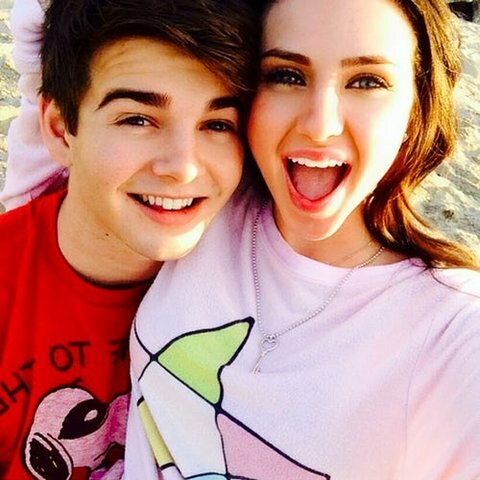 Ryan Newman dated an actor Jack Griffo. The duo first met on the set of The Thundermans, they played the role of one another love interest in the series. However, the couple failed to handle their love life and officially called off their 3 years long relationship in 2017.